Most VW Polos will be found on city streets. The hatchback can both slice into traffic gaps and squeeze into parking spots. Then there's its quietly dignified styling, which blends into the urban milieu, and a comforting interior that eases congestion’s grind. It’s all very proper. And sensible. Enlivening the range is the GTI variant. Flashes of red subliminally reveal it has a mischievous side. Red brake callipers hide behind large 17-inch alloys; a red stripe lines the front radiator grille; and red accents complement twin halogen lamps. The touches are small enough to keep the Polo’s inconspicuous character in tact, but substantial enough to know this is no ordinary city dweller. The car’s interior echoes the same sentiment. The dashboard is dressed up with touches of gloss black insets, while aluminium is used to accent the gear stick and the pedals. It’s used comprehensively on the steering wheel, which has the feel it was machined from a large aluminium block. Space upfront is adequate. People six-feet tall can command the car comfortably, although those in the back will feel tightly packed, deeming it best suited to children and perhaps teenagers. 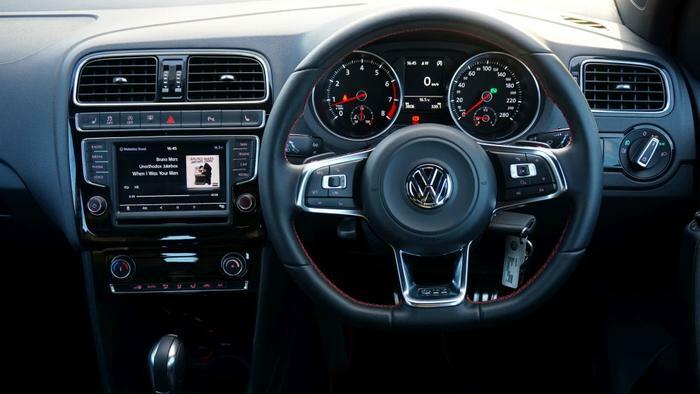 Volkswagen cars have a healthy dose of technology. There is a prevailing sense long deliberation was held to determine which features add value to the driving experience. All of the technology fitted is focussed; if it’s not pertinent, then it doesn’t make the cut. For instance, the seats have to be adjusted manually, but the GTI comes with an excellent reverse parking camera. People change their driving positions once in a blue moon, but we reverse a car a number of times a trip. An excellent infotainment system hosts sophisticated technologies in an easy-to-use interface. It is managed by a 6.5-inch touchscreen, and it is bordered by buttons that work as shortcut keys. This means it is easier to get from one part of the menu to another. Clever design makes it easy for drivers to control the car’s technology. Situated in the centre of the instrument cluster is a trip computer that presents contextual statistics and information. Buttons mounted on the steering wheel make it possible to control any part of the car’s infotainment system. Hands don’t need to be taken off of the steering wheel and eyes can stay firmly on the road. 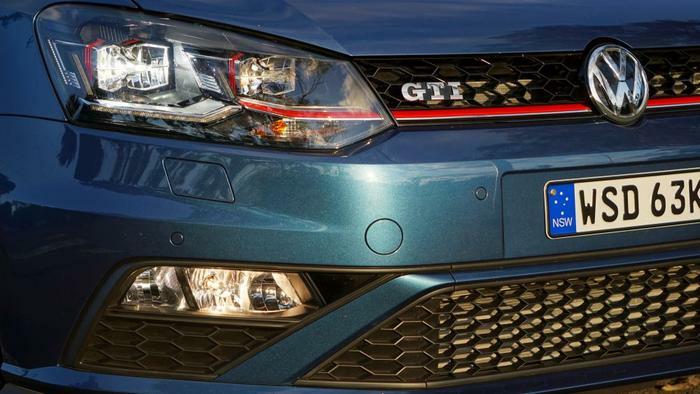 The GTI retains all of the hallmarks of a responsible car, and this sets it apart from similarly priced rivals, such as Ford’s Focus ST and Holden’s Astra VXR. It has a 5-star ANCAP safety rating and better fuel economy. Its engine is of the stop-start variety and it will recuperate energy that is otherwise wasted when braking. 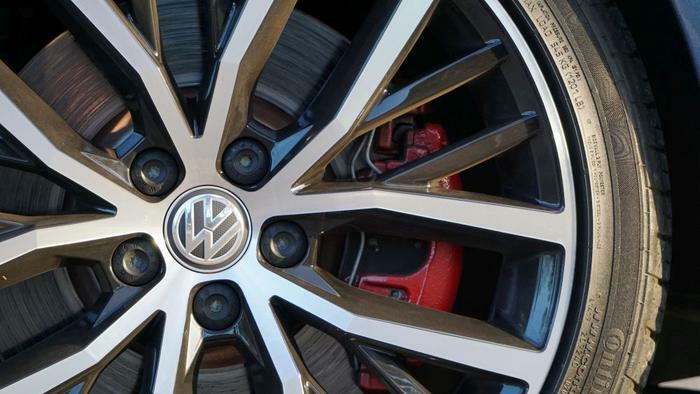 Five long years have passed since Volkswagen offered the GTI with a manual transmission. Purists will appreciate the availability of a 6-speed manual, particularly because its torque threshold is higher at 320Nm, even though its quoted fuel economy is a lower 6.1-litres for every hundred kilometres. Those who opt for the automatic will hardly whine over the DSG gearbox. It has a secondary clutch that readies the next gear for a quick shift, all within four 100ths of a second. The torque threshold is 250Nm, but it’ll burn less fuel at 5.7-litres for every hundred kilometres. The Polo GTI being reviewed came with the DSG gearbox. The automatic gearbox supports manual changes from both the gearstick and paddles mounted to the steering wheel. Changes happen with such ferocity that there is no discernable loss in power. Departing from custom is the GTI’s engine. The 4-cylinder, turbocharged engine ditches a supercharger in favour of a larger 1.8-litre capacity. It delivers 141kW of power to the front wheels, and because it weighs a light 1242kg, it’ll reach 100km/h in 6.7 seconds. Long time fans of the marque will miss the vocal range of the old GTI. Its successor is less riotous in tune, but it will give off a melodious track as it builds up to speed, punctuate gear shifts with a ‘puff’, and bark as it winds down revs. It has the texture of a precision instrument — much like a neurologist’s surgical tool — as it uses science to quantify a balance between speed and involvement. This theme runs prevalent in the way the car handles. The electro-mechanical steering is light and tactile. Point the car at a bend and it’ll cling on the inside line, its stout wheelbase feeling as though the car is wrapping itself around the bend, as it uneventfully works through one corner after another. VW’s extended electronic differential lock (XDL) is behind some of this magic. It applies a precise amount of braking pressure to the inside wheel for a dynamic change in direction. Astute handling is the by-product of a negotiation between performance and comfort. Partially worn roads tax the ride quality. Potholes are cushioned, but not enough to stop the car from feeling as though they are being ridden — and not ironed out. 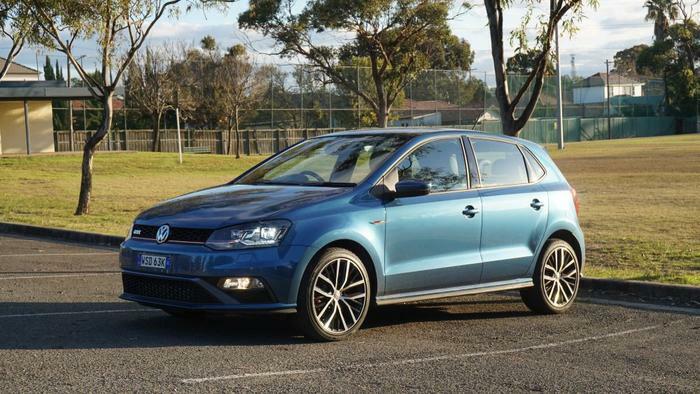 The compromises on the Polo GTI are tiny in the scheme of things. This is a car that can be used to take kids to school, hit the motorway for a road trip and drive home after a long day at work. It’s versed in both responsible petrol economy and outlandish performance. As far as hot hatches go, it is the best of both worlds.